MRI Conditional Single bag Hamper with Red PVC frame to represent Bio-Hazard Environment. Over all size is 26.5"long x 25.5" wide x 38.5" High. 25.7 gallon capacity. 3" Twin casters. Zip-front opening eliminates possible back injuries from lifting heavy loads of laundry. Floor plate supports the bag and keeps it off the floor. Comes with Foot Pedal to activate high impact plastic lid. Red Mesh is anti-microbial, flame resistant, mildew resistant, easy to clean, and has a high tear tensil strength. This hamper is easy to move, easy to store, and easy to maneuver! 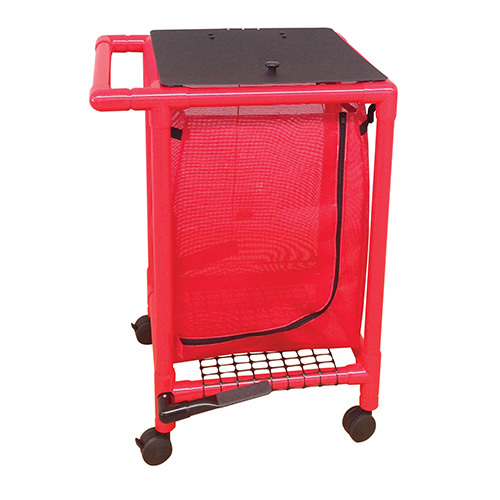 In accordance with OSHA regulations, our lightweight hampers come with ergonomically positioned push/pull handles, heavy duty threaded stem rolling casters and easy to open covers.